The Seville Sour Orange, is essential for great tasting, authentic English marmalade. Named after the city in Spain (because they have been grown there as an ornamental since around the end of the 12th century), the Seville orange is also called bitter orange or sour orange. In contrast to its relative the sweet orange, Seville orange fruits have a bitter peel and sour pulp and are not eaten as fresh fruit. 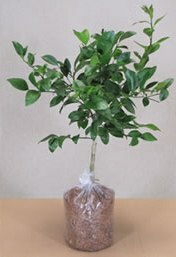 The trees are widely used as an ornamental with dark green leaves. The fruits have a pebbled skin that is rougher than that of sweet orange and a more vivid color. Flowers appear in late February into March with a sweet fragrance.